Note: The photos in this article are "clickable" to view larger versions. Back in 1969, the marketing/advertising geniuses at Anheuser-Busch introduced a character that was destined to become perhaps the most recognizable symbol of Budweiser in the history of the brand. I’m referring, of course, to that "Dauntless Defender of Quality" --- Bud Man. He quickly became the official mascot of Budweiser and has been used in such varied promotional products as display signs, key chains, inflatable figures, salt & pepper sets, shirts, hats, belt buckles, even costumes. Some six years later the marketing people realized that he would be a natural as a character stein - and that brings us to 1975. Although Anheuser-Busch had been issuing steins and mugs since 1894 (two steins by Villeroy & Boch) there was no comprehensive list of the steins. It was in the year 1975 that they finally instituted a cataloging system for their future stein introductions by using a letter-number combination to both categorize the stein/mug and indicate its order of introduction. 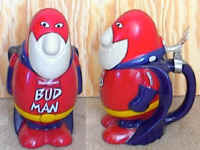 The first stein issued under this new system was also their first character stein, Bud Man, and was given the series number CS-1 (Collectibles Series Number 1). Other letters have been assigned for other categories of Anheuser-Busch steins: SO (Special Order), N (Novelty), CB (Collectors Club), GM (Gerz Meisterwerke), GL (Gerz Collectorwerke) and GZ (Gerz Old World Gallery). Two of the major variations of CS1 Bud Man are the knotted and the unknotted bow tie. The first Bud Man stein was introduced with a retail price of $5.95 and was made by the firm of Ceramarte of Brazil. It is 7 ½" high and is known to have been produced in at least 13 variations. Contributing to the variations are 3 thumb-rests, 2 hinge types, two head types (solid or hollow), 3 basemark variations, 2 body types, and color variations. The red colors vary from bright to light, and sometimes even orange, while the blues range from a rich, dark blue to a light, faded denim shade. The skin tone varies from a cream color to a dark tan. Among the hollow head steins, some have a plastic plug inside the head (at the back of the nose), while others have none. Different styles of the painted eyes are known, and variations on the body include a knotted bow tie as well as an unknotted version. Also, some of the early production runs did not have the Registered Mark (®) following "Bud Man." Generally, these differences are attributed to hand production methods and technological improvements introduced during production. However, I have also read that Budweiser had numerous prototypes under evaluation and may have inadvertently approved multiple versions for production. Even with its multitude of looks, CS-1 is easy to recognize. He wears no belt, sports a tan colored bow tie, and the lid opens where his mouth is located. The stein was produced in an "open" edition and the exact number produced is unknown. The second version of the Bud Man Stein was introduced in 1989. In the 14 years since the original, he really didn’t change that much. He was still a rotund little fellow, although at 8" he had grown a little. He took to wearing a yellow belt, and now favored a red no-knot bow tie with Budweiser written across it. His uniform gained the word "genuine" on the sleeve and he changed from blue to red shoes. The most noticeable difference was that the lid was now formed from his entire head, with the stein opening at his shoulder line. Again the stein was produced by Ceramarte of Brazil and was issued in an "open" edition. At a retail price of $29.95 he had been seriously impacted by inflation, but was still popularly priced. The June 1991 Prosit (the SCI quarterly magazine for Stein Collectors) contains a wonderful article by Les Hopper featuring the first two Bud Man steins. In that article he goes into much more depth than I can here. 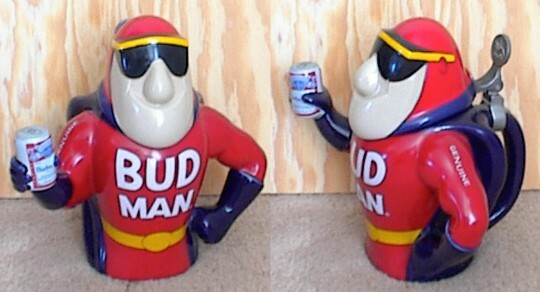 1993 CS-213 - Bud Man, Dude! In the span of only 4 years, quite a bit changed. The Anheuser-Busch Collectibles Series of steins went from number 100 all the way up to number 213. While indicative of the increased popularity of stein collecting in general, this also demonstrates the very strong following claimed by Anheuser-Busch in our hobby. There were quite a few changes in Bud Man during those 4 years also. He must have gone on a diet and started hanging out at the gym, because all of a sudden our round little fellow developed quite the buff bod. His waist was slim and trim, he developed arms with muscular definition, and he acquired some designer sunglasses. In a word, the Bud Man became hip. The newest edition from Ceramarte was a totally different Bud Man. He no longer wore a bow tie, of any color. His arms were out, away from his body. One arm was extended and holding forth a can of Budweiser and the other arm was cocked with his fist against his waist. The stein was the same 8" in height as the previous version, but it ended slightly below his waist rather than including his shoes, giving him a long-torso appearance. Once again Anheuser-Busch issued the stein in an "open" quantity edition. With a suggested retail price of $45.00, this was a lot of stein for the money. Six years have passed and the impact of Anheuser-Busch on stein collecting continues to grow. Their Collectibles Series continues to add steins at a breakneck speed. 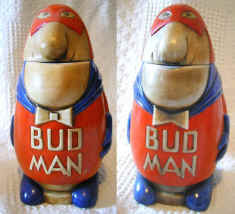 In a world of such rapid growth and instant change, it is a pleasure to report that Bud Man has returned to his roots. Gone are the sculpted waist, the bulging biceps, and the expensive designer shades. As most of us can attest, diets don’t work and people who hang out in gyms are just weird showoffs. We have back our beer-belly bodied Bud Man! In honor of the 30th year since the inception of the Bud Man Mascot, the newest version of the Bud Man stein has elements from his previous incarnations. He once again has a mouth that opens with the lid. He again wears no belt and is back to his blue shoes. He now sports the red bow tie with "Budweiser" written across it and has misplaced his sunglasses, exposing those eerie Bud Man eyes. He has a banner on his ample body explaining that he is the 30th Anniversary Bud Man. And, as most of us who have ever fallen off a diet can relate to, he has come back bigger than ever. The newest Bud Man stands almost 10" tall and has gained admirable girth. 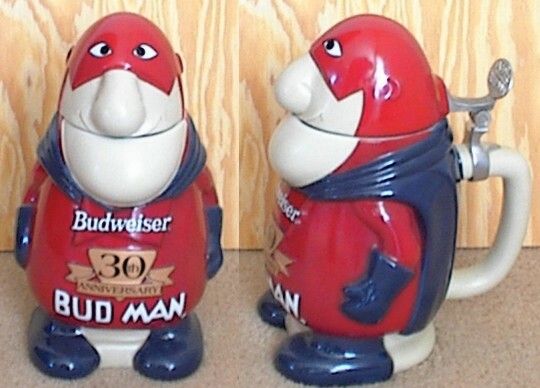 Unlike the previous Bud Man steins, he was issued in a limited edition of less than 25,000 steins and at an issue price of $100.00 he is by far the most expensive entry in the Bud Man series. In his 1991 Prosit article, Les Hopper predicted that Anheuser-Busch would someday issue a Spuds MacKenzie stein. Almost 10 years later they took his advice and issued CS 455. I understand Les is getting a hefty royalty from every Spuds stein sold. Ceramarte has grown to become the largest stein producer in the world. They now employ an unimaginable 1500 production workers at their Rio Nigrinho, Brazil facility. Although Brewery mugs and steins have been around almost as long as there have been breweries, brewery sponsored Character Steins are seen much less frequently. Among American breweries, the first to create brewery characters was Utica Club in 1959 (Schultz & Dooley) followed by Budweiser in 1975. Other American breweries that have issued character steins include Corona, Miller, Titletown, Neuweiler, Hamm’s, and Leinenkugel. If you had purchased 2500 Bud Man steins in 1975 and stored them, that $15,000 investment would be worth almost $1,000,000 today. I wish I could remember where I stored mine. The term "Open" Edition infers a production quantity planned above 50,000. The actual quantity produced may have been less. Last, but certainly not least, thanks must be given to Bill Parkinson who supplied the photos of CS1, the original Bud Man stein. Bill has made it a personal quest to own every single variation of Bud Man known to exist. His collection of the original 1975 Bud Man steins now includes 14 different versions. Yes, 14... one more than Anheuser-Busch has acknowledged. Anyone want to start a pool on how many versions Bill will eventually find?